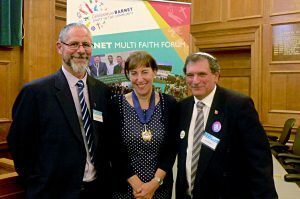 Interfaith Week, The national event promoting of multiculturalism and diversity in Britain, was welcomed in the London Borough of Barnet last week by the Barnet Multi Faith Forum (BMFF). 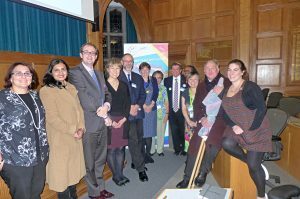 Two special events highlighted the diverse range of faith-based organisations in the Borough. A fair at Middlesex University during the day brought together over 25 different faith-based bodies, including Churches Together, Soka Gakkai International (SGI) and the Jewish Volunteering Network (JVN), to showcase their work and the impact of faith-based social action in the community. 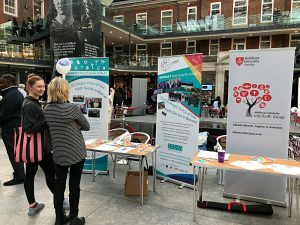 Other organisations including, Homeless Action Barnet Inclusion Barnet Health watch and Middlesex Fairtrade and were joined by the university’s Jewish and Islamic Societies. In the evening, members of these organisations, other faith institutions and places of worship gathered in the Council Chamber at Barnet Town Hall to hear from a variety of presenters including Rene Cassin updating us on the iniquity of Human trafficking and Slavery, Trinity Church providing an emotional report on poverty and debt related issues in the borough and the Ismail Community showcasing their work with many other faiths in supporting food banks refugees and the homeless. The evening began with a moment’s silence to commemorate those who sacrificed their lives for their country during the two World Wars, along with all those brutally murdered whist at Sabbath prayers in Pittsburgh, those suffering from genocide in Myanmar and Syria, famine in Yemen persecution in Egypt and the shocking imprisonment and discrimination of Asia Bibi in Pakistan. For more information on the work of the BMFF email info@barnetmultifaithforum.org.